I was deciding on what to eat on the eve of Deepavali and couldn’t really decide as there are simply just too many choices here in Singapore. 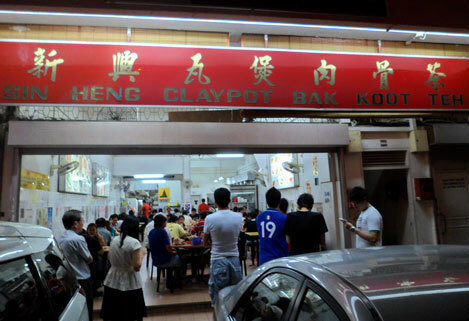 At 5.30pm, got a text from a friend, Eric and he asked me if I am up for some claypot Bah Kut Teh in Joo Chiat Road. I replied back in a heartbeat with just a simple text “ON!”. I like it when this happens when you are not sure what to eat and suddenly someone makes the decision for you, what more when that someone offered to come pick you up. We arrived at Joo Chiat at around 7.30pm and there’s no parking available. We kept circling and driving to look for parking but still couldn’t manage to find one. We almost gave up and wanted to go eat something else. As we circled back again near to the restaurant, we noticed there’s a carpark in a building call Katong Junction. The building was just next to the restaurant and we never knew this car park even existed. We drove in and there’s one more slot available. Awesome! As we approach the entrance of Sin Heng Bah Kut Teh, there’s no seat available and also a lot of people are waiting for available tables. We waited for around 10 minutes and finally got our seat for two. We ordered right away and didn’t the service was really fast. I think our dishes came less in 10 minutes. We ordered a small pot of “Sin Heng Special Bah Kut Teh” which cost 8 SGD. Singaporean and Malaysian are especially proud of this dish. Reason being, this dish was invented by migrant Chinese workers who came from China to Singapore in the early 1900’s. 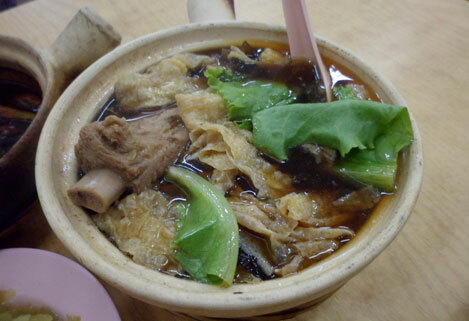 It is a herbal soup dish which contains pork ribs, innards, vegetables, dried tofu skin and mushroom. Back in the days, this dish is meant for only poor migrant workers who needs the extra energy as they work as laborers. No time to stir fry or make fancy dishes, just throw everything in a big pot of boiling water and you get Bah Kut Teh with all the nutrition in it. I didn’t even know that Bah Kut Teh wasn’t available in China, Taiwan and Hong Kong till I have friends from those countries visited me. They told me is almost impossible to find good Bah Kut Teh in their countries. 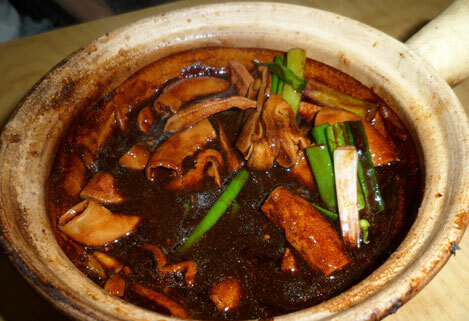 Next on our order list is another claypot dish. Not a soup but a dish with pig innards cooked in thick black sauce most likely with dark soy sauce, oyster sauce, sesame oil, ginger and I bet a whole lot more stuff and some secret ingredients. 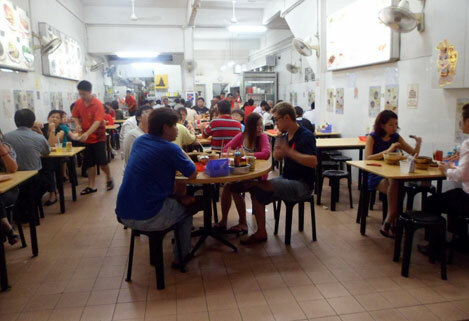 In Sing Heng Bah Kut Teh, I love this dish the most as opposed to what they are famous for, the claypot Bah Kut Teh. The sauce is just simply AMAZING and if you are a rice lover, I bet you will have a field day eating few bowls of rice. Most Bah Kut Teh restaurant will have chopped bird eye’s chili, big red chili and fine chopped garlic available at your disposal. However in Sin Heng, the fine chopped garlic is not available for free. You have to order and it cost around 0.50 SGD for just a tiny bit. Since I love to mixed the chili and garlic with soya sauce as the dipping sauce for my meat, I have no choice but to pay for the garlic. Next time I will bring my own chopped garlic. Not that I am a cheap skate but I am used to the fact that I get it for free in all the Bah Kut Teh joint! 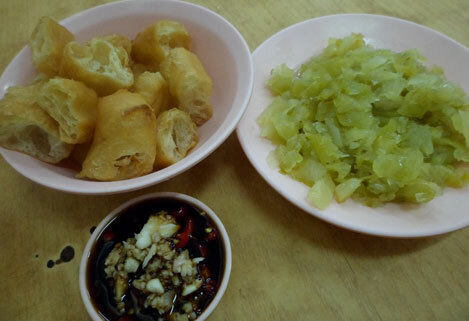 We also ordered some fried dough call “Yow Char Kway” and a small plate of salty preserved vegetables. It is kind of a MUST condiments for me when eating Bah Kut Teh. Among Eric and I, we whallop 3 bowls of rice. The dinner cost us 25 SGD with 2 can drinks. I think the pricing is pretty standard when dinning in places like these but I would be happier if the garlic was given for free. I think I prefer them not telling me about the garlic and just secretly put it in the bill.